When companies like Google, Starbucks, Shopify and GE want to know What’s Now/what’s next, they call Mitch Joel. Mitch Joel has been called “one of North America’s leading visionaries” and the “Rock Star of Digital Marketing” by Strategy Magazine, but he is much more than that. 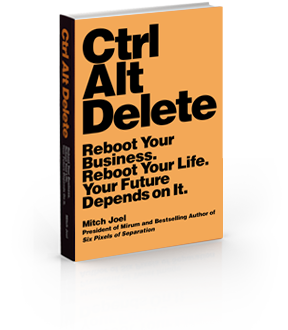 Reboot Your Business. Reboot Your Life. Your Future Depends on It. What does AI really mean for your business today? How Direct to Consumer Brands disrupt and conquer the marketplace (and what every brand must do to take advantage of it). Mitch speaks frequently to diverse groups like Google, Wal-Mart, Starbucks, Microsoft, Procter and Gamble, Twitter, Unilever and every organization and association in between. Since 2005 he has given anywhere between 40-60 keynote presentations a year to small, medium and large organizations in both the B2B and B2C space all over the world. As a professional speaker who can customize every presentation for impact, Mitch is represented by Leading Authorities in the U.S. and by Speaker's Spotlight in Canada.